All recognized equipment will have the official WTF logo of recognition ( see left )clearly marked on it. This allows you to use your equipment in any WTF competition at either regional, national, continental, world or Olympic level. This unique, light weight and comfortable body protector has been on the market now for around 2 years. It is ergonomically and anthropometrically designed to fit the most demanding Taekwondo athletes and is easy to use for both training and competition. The three loop tying system at the back allows the protector to be tied tight or loosly to the body, however a player requires. The protector is a unisex design suitable for both male and female practioners. 2002 World Taekwondo Cup, Tokyo, Japan. 2002 Junior World Taekwondo Championships, Heraklion, Crete. 2003 Junior European Taekwondo Championships, Athens, Greece. 2003 World Taekwondo Championships, Garmisch-Partenkirchen, Germany. 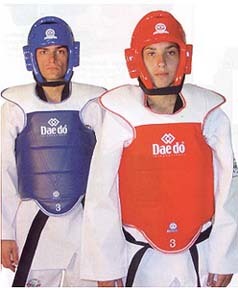 These classically designed, light weight and comfortable head protectors have been a Daedo favourite for many years. They are ergonomically and anthropometrically designed to fit the most demanding Taekwondo athletes and are easy to use for both training and competition. The helmets have been given a number of new features such as a non-slip coating to stop the head guard from moving around the head when kicked. This helps to reduce the problem of small 'head flicks' where the opposing player just touches the head guard and moves it which can be counted as 2 point head shots by the judges. The head guards are a unisex design suitable for both male and female practioners. 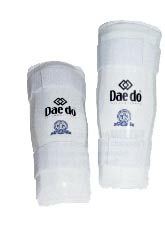 These light weight and comfortable arm and leg protectors are unique for Taekwondo competiton. However despite this they still provide a lot of protection for the arms and legs. They are ergonomically and anthropometrically designed to fit the most demanding Taekwondo athletes and are easy to use for both training and competition. The arm and leg guards fit closly enough to the limb to move with a players arm and legs but are not too tight to cause any discomfort. This unique, light weight and comfortable groin protector is ideal for all Taekwondo practitioners. It is ergonomically and anthropometrically designed to fit the most demanding Taekwondo athletes and is easy to use for both training and competition. Available in both the male and the female versions. Tae-Yang is a relitively new Taekwondo equipment manufacturer and has a number of new products available for purchase. Excellent HIGH QUALITY SUITS, HIGH QUALITY PROTECTORS and MATS are all part of the Tae-Yang product range. I have found their equipment really satisfactory and of an excellent standard. The good thing about these products are that they are excellent for beginners, national and elite international players to use as they are comfortable light weight and durable. The Tae-Yang company is under the control of MR Vincenzo Cozzi and interested buyers can purchase items through www.tae-yang.com or through the links page on this website. For all elite players who have doubts about these products I urge you to try them out in training or competition as I feel the future is bright for Tae-Yang products. Click on the left picture for a link to the Tae-Yang website.